Running space in our country is dominated by men, and for women to make an entry into this area, has taken a lot of time and effort. Over the last few years, women participa in marathons has shown an increasing trend. What is also heartening to see is that more women have felt comfortable with their body image and have stepped out to run. Despite these refreshing changes, women continue to face challenges while training for and running in such events. Men have a huge responsibility in helping make their running a safer and a pleasant experience. Events like the Pinkathon have brought together large groups of women from all strata to run various distances from 3k to 10k, across many cities in the country. A large number of first-time runners find it comfortable to try their hand at running in these events. Atleast some of them get bitten by this bug and then graduate to longer distances and other events. Individual pacing for HMs is a concept unique to Pinkathon. It involves a dedicated pacer assigned to a racer usually by choice, who then, interact and chalk out their target timing, pacing strategy and other details. My experience with individual pacing has been of four runners of different caliber, running experience and tenacity. These contrasting personalities made it an enriching experience for me pacing these women. Shalaka – a strong and relatively faster runner, usually doing 10k and having done a HM with a timing of 2hr02min. She was keen on a sub-2hr HM which is the first major milestone. Knowing her urge to improve and willingness to train well in whatever time she had, I gave her a brief training plan which helped her formalize her training in the last few days we had before the event. After a short run with her to understand her better, we returned to only meet at the start line of the event. Being a 10k runner, it was more important to control her pace in the beginning to have a steadier pace throughout the second half. Shouting out motivational stuff and pepping her up all through the route ensured that she didn’t slack as much in the second half and ended up finishing strongly in 1h:58min, well within the intended target. There is a major role of mental robustness in getting good performances. What translated into a 4min improvement was just removing the brakes that her own mind was applying while she ran and I just helped her mind get out of her own way. Trupti was a bulky, slow runner who had metamorphosed into one with immense strength and tenacity, looking to improve all the time. Having seen her through her challenging times of injury lay-offs and moments of despair, I knew this was one person who would benefit a lot from my experiences of returning from injury and whatever I could offer with my training plans for her. After accompanying her on a few practice runs, she was all set to take on the tough course of the Pune International marathon 2015. Pacing her through this challenging route with daunting elevations was a great experience, where I learnt how strong women can be, if only we would share a few miles with them while they shattered their barriers. Pacing in the Pinkathon 2016 was different. Having pushed and prodded Rinky Joshi into running longer distances and advising her on various aspects of running, it was an association of mentorship that was to translate into a role as a pacing partner. She had recently run her maiden HM done reasonably well with a timing of 2hr09min, no mean task for a first HM. Pacing her was to be more of guidance en route after a proper period of preparation, both physically and mentally on the nuances of running an HM. Proper training plan, a few long runs together with advice on hydration and energy breaks, guidance on diet and strengthening was shared prior to this event. The race day was eventful, with first half of the race spent on managing what looked to be a wardrobe malfunction, while the second half was of an energetic negative split, after effective handling of the situation by the racer-pacer combine. For the 2018 edition of Pinkathon, it was Abhilasha, a recent convert to the HM distance, with a strong determination to improve upon her previous best. Having seen the diligence and discipline with which she trained, it was easy to share a training plan and see the workouts being executed well. The race day was one of flawless execution and a personal best by huge margin for a mentally tenacious runner. 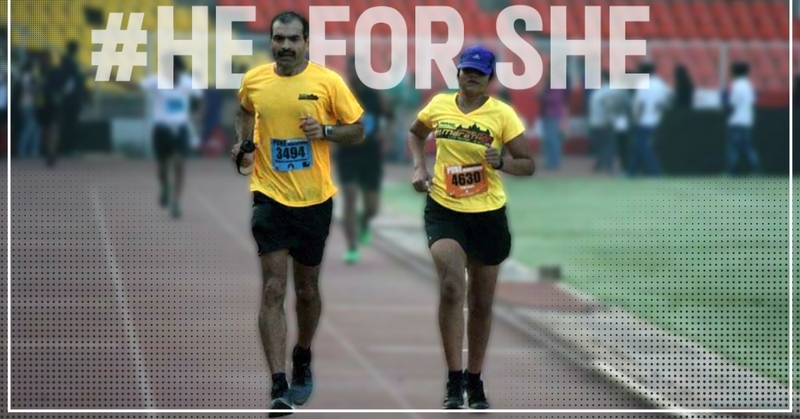 These experiences brought out the essence of #HeforShe, wherein a guy placed along with a woman runner shares the running space with her for a few weeks, helps her to prepare for a race and sees her through the process of successful execution of their targets, and share the learnings from the experience with others. So What will bring out more women runners who are hesitant to step out? In the larger context, what is practiced over a few weeks of run up to these events should be translated to how men generally interact with women runners and help each other excel in an environment of safe and secure running space. As men, we should pledge to support and positively interact with women around us to create a space, physically and socially conducive for them to bloom as runners. We should spare sometime accompanying them to train for their events, often difficult for a lone woman to do, especially in her long runs. Pacing in events where she wants to improve her performance is another way one can boost their morale and motivate them to perform better. Given such an environment, I am sure they will excel and even outdo a lot of us, which we should accept with chivalry. This will create a world of healthy women, healthy families and a healthier gen-next. Wow! What a great and noble man ….Cheers!! May your tribe increase by the dozen….